Collection: MOCA’s First 30 Years is an overwhelming and astonishing exhibition arranged according to a loose chronology, containing a treasure-trove assortment of over five hundred works by over two hundred artists, from 1939 to the present. It’s a challenge just trying to see every work in the museum’s two cavernous Geffen and Grand Ave. buildings, but the remarkable amount of work guarantees something for everyone. It’s an amazing and commendable show. That said, this is not an exhibition without problems. Aside from the inevitable questions of who gets included, whose work shares a gallery, and which collectors see their donations exhumed from storage, MOCA’s curators, led by Chief Curator Paul Schimmel, had to discern which work best exemplifies the institution itself. This last and most problematic question lingers heavily in the air, coloring how one sees each work as a representation of MOCA’s past, present, and future. The last year and a half for MOCA was a perilous and controversial time, to say the least. In November of 2008, The LA Times revealed that the museum was running on fumes, its operating costs far outweighing its dwindling endowment. In response, Jeremy Strick, the museum’s Director, floated the idea of dissolving the museum, and merging its collection with LACMA just down the road. Then, all hell broke loose. Letters were written to editors and angry crowds demanded answers. LA wouldn’t stand the idea of losing MOCA. Strick resigned, and Eli Broad, L.A.’s resident Medici, swooped in with $30-million to save the museum. Nearly a year later, the board announced that the art dealer / gallery owner Jeffery Deitch (a Broad chum) would become the museum’s next Director. The decision was met with restrained praise from the art world, though a palpable undercurrent of concern still lingers; many see the Deitch appointment as a harbinger of conflicts of interests to come. 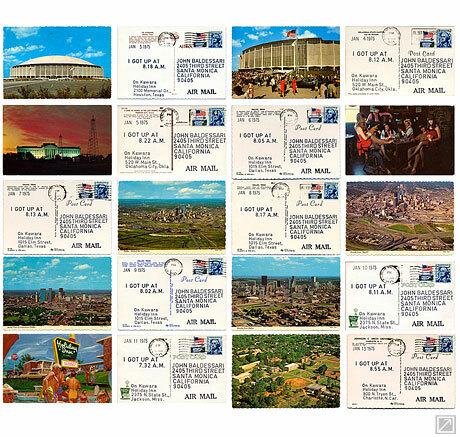 In between Broad’s cash injection and Deitch’s appointment, 30 Years opened to the public. When Pop Art asserts itself in the Grand Ave. building, in the same room as a powerful installation of Claus Oldenburg’s drippy plaster commodities from his groundbreaking 1961 installation, The Store, echoes of the museums very recent tumultuous near death experience come to the fore. 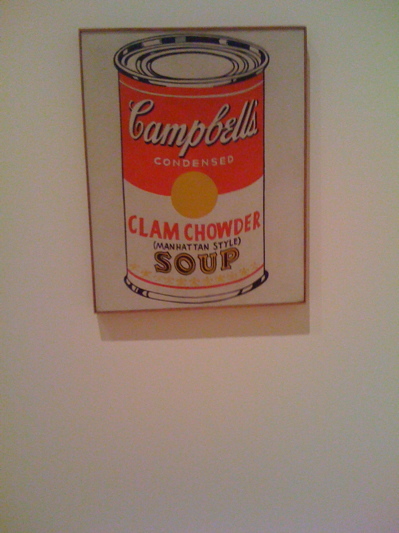 Try taking a picture of Andy Warhol’s 1962 Campbell’s Soup Can (Clam Chowder- Manhattan Style) and a museum guard will politely ask you not to photographs the work. Why? Just look at their wall labels. 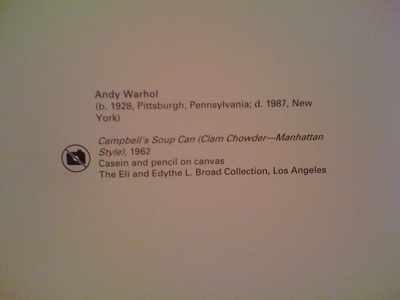 Both read: “The Edyth and Eli Broad Collection, Los Angeles,” next to a crossed-out camera ideogram. Both works, and at least three more, belong to the Broads and are not even promised gifts to MOCA. While the Broad’s pieces fill a gaping hole in MOCA’s collection, which houses only one pivotal Warhol, his Telephone, a hand-painted work from 1961, their presence, as privately owned works on loan from the museum’s major creditor, is even more conspicuous, and compromises the exhibition’s stated goal: to show work the museum owns. If the Broad pieces are allowed into play, why not borrow more work, from other collectors, to mend another problem: the dearth of women artists, who make up about one fourth of the total artists represented? The exhibition highlights a few undeniable touchstones. 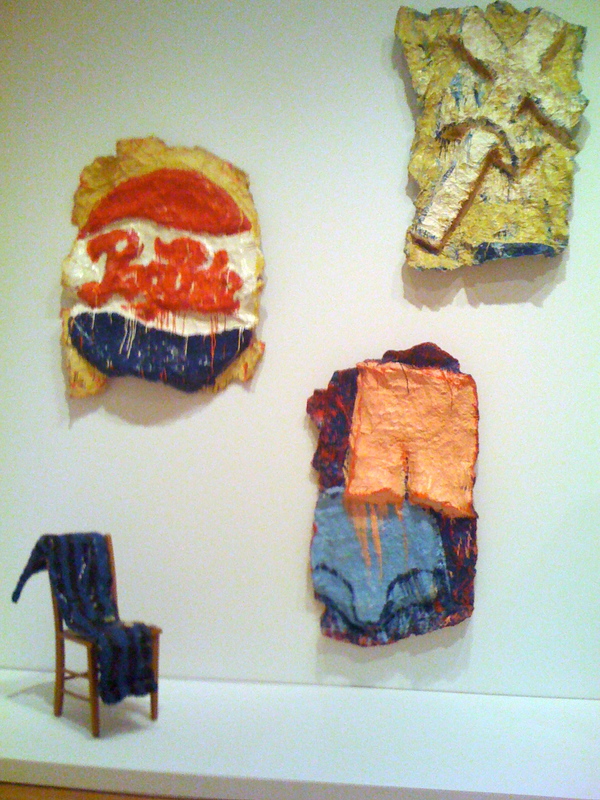 MOCA has impressive Rothko and Kline collections, and owns some of Rauschenberg’s best combine sculptures, which alone are worth the price of admission. Of the more contemporary artists represented, Paul McCarthy, Renee Green, and Mike Kelly, each stand out with large, complex, and engaging installations. That said, the exhibition isn’t so kind to every piece. Louise Nevelson’s impressive but poorly lit Sky Cathedral/Southern Mountain from 1959 languishes like an afterthought against a chapel-like room designed specifically to highlight Jackson Pollock’s No. 1 from 1949. In the Geffen building, Andrea Zittel’s A to Z Breeding Unit: For Averaging Eight Breeds, from 1993, is easy to miss, hidden away in darkness just left of the entrance. 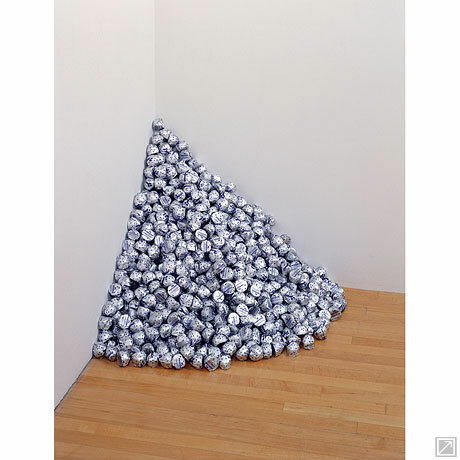 And most astonishing of all, Felix Gonzalez-Torres’ Untitled (A Corner of Baci), 1990 is entirely missing. Replacing the 42 pound pile of chocolates every day is obviously too expensive for the cash-strapped museum. 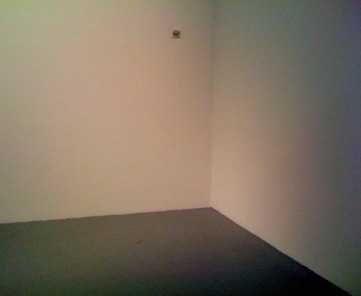 Where Felix Gonzalez-Torres' Corner of Baci should have been. But without proper contextualization, one is left to ask where, and when, these quotes come from. MOCA has provided a telephone number that visitors can call to get more information about select works on view. The phone-in info is quite good, but what is one without an unlimited calling plan or, GASP! no cell at all, to do? When the show succeeds, which is does more often than not, it’s by creating unexpected connections between seemingly unrelated works that would otherwise remain anchored to well-worn art historical narratives. 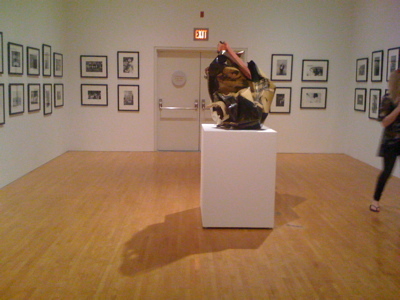 This happens in a room where The Americans, Robert Frank’s seminal photo series, encircles Rayvredd, a modest sculpture of crushed automotive oddments by John Chamberlain from 1962. Before this exhibition, I would have thought the two artists’ works couldn’t be farther apart, yet here they riff off each other with oscillating evocations. Moving through Frank’s America, rife with booming car culture, blinding optimism, bombastic politicians, and seething inequality, Chamberlain’s glistening conglomeration of twisted metal resonates as a physical and metaphorical reminder of the turbulence, violence, and crashes that also populate the American dream. When 30 Years closes after its nearly seven-month run, misgivings about poor budgeting decisions, questionable appointments, and overlooked artists will no doubt persist. Such critiques are vital, perhaps more than ever, and they surely will help to keep MOCA in check. But in the end, once the works return to their vaults, no one will doubt the museum’s indispensible place as a home for contemporary art, its position as an invaluable resource, housing some of the greatest works since World War II. Tucker Neel is an artist and writer based in Los Angeles. Originally published in ART LIES magazine No. 58, Summer 2008, p. 98-99. When Sony released its first portable video camera in 1967 artists on both American coasts latched onto it as a tool providing immediate visual fidelity and freedom from the hassle of celluloid film. However, the new medium was not without complications. Editing required costly machinery and no one knew if video would meet archival standards. On the West Coast, the Long Beach Museum of Art recognized video art’s growing importance and in 1976 it created a video archive and editing facility allowing for hundreds of artists to make and preserve their groundbreaking works. The Getty Research Institute acquired the archive in 2006, providing the sometimes bawdy, oftentimes political, and always experimental videos with an oddly conservative and incongruous home. The museum’s recent California Video exhibition celebrates this new acquisition with an expansive showcase of over fifty sprawling single channel monitors and fifteen installations of modest to spectacular scale by fifty-eight artists and collectives who made these works while residing in California. More than half of the works in the exhibition are from the Long Beach archive, the rest gleaned from other sources or made specifically for the Getty. 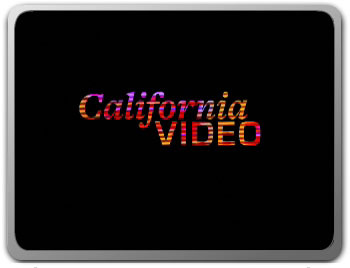 An ambitious undertaking by Getty curator Phillips, the show is daunting, a little sloppy, but ultimately inspiring, providing an opportunity to chart video’s rather nascent history and explore what exactly makes California video intrinsically Californian. As the first video one encounters in the exhibition, John Baldessari’s I Will Not Make Any More Boring Art from 1971 acts as a sounding board for the rest of the works in the show. Displayed on a chipped wood-paneled Sony TV, the video captures the artist writing “I will not make any more boring art” on a sheet of paper for an excruciating thirty-two minutes an twenty-one seconds. In exploiting the very essence of video, its ability to capture an action and play it back in real time, Baldessari uses self-reflexive humor and an innate understanding of the viewer’s role as spectator to make a poignant joke about art and entertainment. The most resonant works that follow incorporate this kind of sensibility, freely blurring the boundaries between art and entertainment, humor and critique, boredom and engagement. From Baldessari’s intro, the exhibition continues along a relatively chronological path, with works loosely grouped according to formal and conceptual concerns. Late 1960’s black and white videos incorporating rudimentary psychedelic special effects by Skip Sweeney and Joanne Kyger are positioned near one another. These early experiments find their legacy in more colorful, almost formalist videos, from the 1970’s by Stephen Beck. His trippy chromophilic patterns line the same hallway as Erika Suderburg frenzied 2006 video abstractions, which are actually close ups of Linda Besemer’s paintings. Elanor Antin’s ballet performance video, Susan Mongul’s ruminations on women’s clothes, and Martha Rosler’s layered exposé on anorexia nervosa, all groundbreaking works stemming from a commitment to feminist practices, are in close proximity to one another. While these works are well contextualized with explanatory texts, their conspicuous grouping borders on ghettoization. And, in what can be taken as a dumb curatorial joke, some of the most interesting body art in the show is crammed together into one cramped room so that one has to literally crawl over other visitors to see amazing videos by Skip Arnold, Bruce Nauman, the Kipper Kids and Ulysses Jenkins, among others. Thankfully other larger installations throughout the show don’t suffer the same fate. In The Eternal Frame from 1975-76, recreated specifically for the exhibition, San Francisco Bay area artists T.R. Uthco and Ant Farm situate their video in a 1960s American living room diorama adorned with knick-knacks memorializing the Kennedy presidency. Sitting on comfy couches, visitors watch the artists’ 22-minute color and black and white video on a vintage TV. The hilarious documentary follows the artists’ hyperbolic restaging of Zapruder’s famous JFK assassination film. In one scene, actors playing John and Jackie rehearse the assassination on a rickety set, Jackie winking to the camera as she rushes to hold her co-star’s head together. By using decoration, artifice and spectacle to create meaning both in and around the TV screen, the artists explore video’s ability to entertain while manipulating events and shaping national debate. This kind of preference for a simulated environment ripe with contradictions and righteous irreverence seems to be very Californian, a reflection of a culture actively in the business of turning media-fabricated dreams into reality. Projected on a wall in another gallery, Stanya Kahn and Harry Dodge’s Whacker takes a more recent view of the Hollywood dream machine. Shot with the low-tech DIY aesthetic of a Youtube video, the piece has Dodge behind the camera following Kahn as she uses a buzzing weedwacker in a Sysiphisian attempt to clear dry, golden grass from a Los Angeles hillside lot on a sunny afternoon. Chewing gum while decked out in aviator sunglasses, a flower print halter-top and heels, Kahn looks more bored than exhausted with her repetitive work. When she stops to survey her progress and gaze out at the palm trees silhouetted in the hazy sky, she is the picture-perfect embodiment of disengaged LA nonchalance. The sun never sets as the seven-minute video loops and Kahn’s work continues indefinitely. This unremitting cycle makes her contrived disinterest more and more intoxicating and comic. The video seems to exclaim that, contrary to popular belief, Angelinos do work hard, they just don’t like to show it. A show about contemporary video art wouldn’t be complete without a nod to Youtube and in keeping with the times the Getty hosts little snippets of work from the show on their website. These excerpts act as teasers designed to bring in patrons. Perhaps more telling though is videorevolutionaries.com, a site actively promoted in connection with the California Video exhibition. Here users can submit their own videos and vote on which submissions will screen at a special Getty event. As a rather transparent move to bring a young, hip audience to the museum, the site reflects this demographic with videos featuring predictably cool special-effects, club music, pretty faces, fondled breasts, blog-like confessionals and shameless self promotions. While these works may never show alongside a Nauman, the ambition behind their creation admirable, a testament to enduring experimentation and a willingness to put it all out in the open which, in the end, may be the most Californian trait of all.